Runners and outdoor enthusiasts of all ages are being invited to put their best foot forward this Christmas at a new fun-run hosted by Northumberland National Park. On Saturday 8 December, the National Park Authority is hosting its first ever Elf Run in a bid to promote health and fitness and the benefits of exercising in the great outdoors ahead of the Christmas period of indulgence. Elves of all fitness capabilities are invited to come along in festive fancy dress to tackle the family-friendly two-kilometre course which follows the trail of Hadrian’s Wall at Walltown Country Park. If running isn’t your thing, don’t worry, you can walk the route too, counting up the festive willow animals along the way before heading back to The Sill: National Landscape Discovery Centre to warm up with a mug of hot chocolate and a special Christmas story reading with local storyteller, Jim Grant. “We wanted to try something a little bit different to kick start Christmas this year!” said Mandy Roberts, engagement officer at Northumberland National Park Authority. “There are so many health benefits associated with spending time out of doors and ideally, we would like visitors to the National Park to experience those benefits all year round, even during the winter months. Funds raised from ticket sales for the Elf Run will be put towards the ongoing conservation of Northumberland National Park to help preserve its beauty for future generations to enjoy. 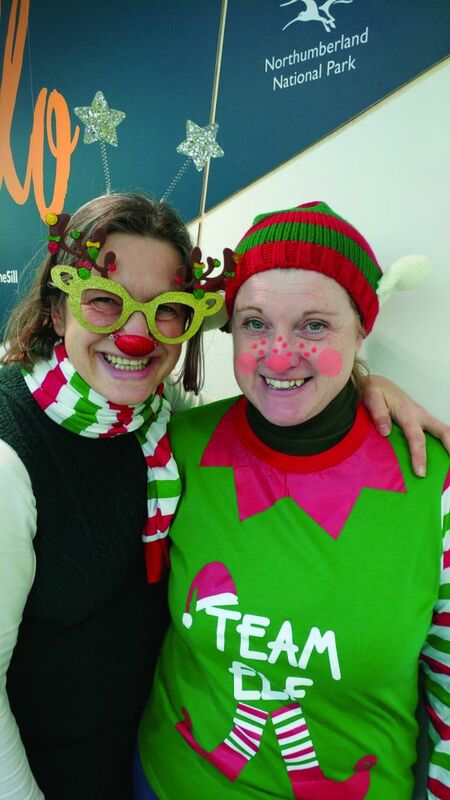 “We’re really excited about our first ever Elf Run. “Encouraging families to get out and explore the National Park is a key priority for us although we appreciate that increment weather conditions during the winter season can sometimes make this difficult. Runners can choose their own start time, with three time slots to choose from at the point of booking. Tickets can be purchased now through the Northumberland National Park website at £5 per child or £8 per adult. A family ticket for two adults and two children can also be purchased for £20 which also includes a free goody bag containing lots of Northumberland-themed Christmassy gifts, including a special National Parks edition of the ‘Mission Explore’ book series which features lots more ideas about how to enjoy the great outdoors. To book your place on the Elf Run, or for more information about upcoming events at Northumberland National Park, visit www.northumberlandnationalpark.org.uk or pick up a copy of our free What’s On guide from The Sill or visitor information points across the Park.